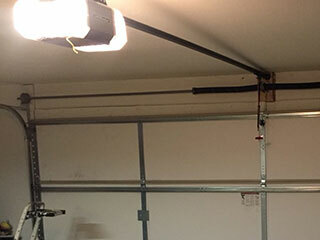 The automation of your overhead door system is reliant on the opener. This unit is responsible for operating the door each time it’s used, as well as making sure that it doesn't close while something is blocking its path. It's comprised of many different components that are all working together to accomplish the goal of opening and closing your door. As a result, there are lots of different problems that can develop, from a wornmotor gear and trolley related damage to faulty wiring issues and incorrectly programmed remotes. Our technicians have expertly taken care of every possible issue many times over, and we are fully equipped to repair units of every make and model. We don’t just fix malfunctioning openers; we install new ones, too. Our team provides guidance on which type of model is best-suited to your home, and will give you all the information you need in order to make an informed decision. Once you know what you want our technicians will provide the full installation service, ensuring that your new opener functions perfectly from the first day. Picking a new opener for your home can be difficult; there are a huge number of brands and models to choose from. What really sets these units apart from one another is the type of drive system they use, and this should be your first decision. There are three main types; chain drive models are noisy, but they’re reliable and more affordable than the others. Screw drive openers are a little quieter, though not entirely so, and much easier to maintain. Belt drive units are the quietest, and they work very smoothly. However they also are the most expensive option. Modern garage door openers are fitted with new technology that can make your home life even more convenient that it currently is. The Chamberlain MyQ app, for example, allows you to control your opener directly via your smartphone; you can let the in-laws into your home while you’re away on holiday, or make sure it’s fully closed after a quick morning dash to work. If you’re in need of fast and effective opener repair service, we can help. We can also assist you with new installations and general maintenance tasks; whatever you require, contact Garage Door Repair Champlin today to find out what we can do for you.